You’ve probably seen the pictures on social media of roofs covered in foliage and wondered if they were for real…a garden roof? Is it really a thing? Not only is it real, but garden roofs are growing in popularity. An amazing example is the Trott Residence in historic Durham, NC. Every detail for sustainable building systems was considered from the ground up. The project design included a metal roof, solar roof panels, and a lush garden roof. 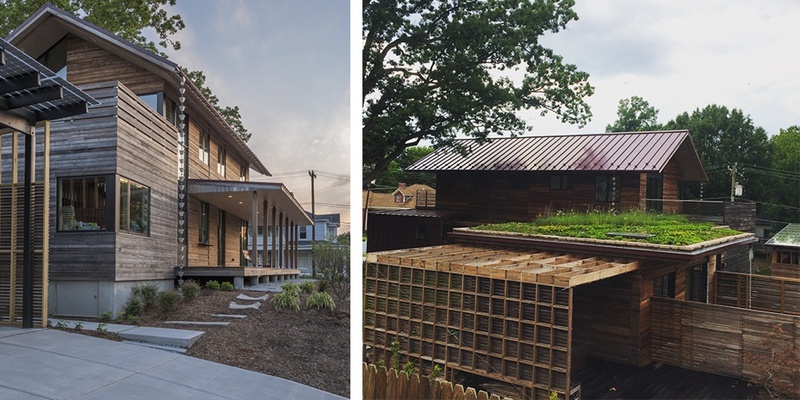 Obviously, a living green roof may not be a viable option for every home and business owner. However, there are sustainable roofing options that can meet any homeowner’s needs. Your roofing system may be one of the most important energy efficiency decisions you will make for your home or business. It is the largest area to take in heat, and to lose heat. Here are some energy-saving roofing elements to consider. When selecting a roofing material, ask your roofing contractor for their solar reflectance index (SRI). The higher the SRI, the greater light reflection you will get in the summer. Although costing more, metal roofs are highly reflective and can reduce energy cost. But be sure to ask your roofing contractor for SRI values by color, as reflectivity decreases with darker colors. Metal roofs are also typically ENERGY STAR certified and may make you eligible for tax credits. Many shingle manufacturers are providing ENERGY STAR certified shingles such as CertainTeed Solaris shingles which contain colored granules that reflect solar energy better than traditional shingles. For businesses or residences with low slope or flat roofs, white TPO material has become a favorite for both its reflectivity (highest SRI) and durability. Also available are highly reflective coatings as an option for those not ready for a replacement. Shingles are just one piece of the puzzle. For example, the materials used in flashings can also be sustainable. Copper is an excellent medium for longevity and recyclability. Other critical considerations for energy efficiency is adequate ventilation and insulation. For both residential and commercial roofs, be sure your roofing contractor provides evaluation and recommendation to both. For renewable energy, you may want to consider and get information on solar roofing options, and/or rainwater harvesting. There is no question that your roofing system is playing a bigger and bigger part of sustainable building and green living. We can’t forget that sustainability includes long term solutions to eliminate early replacement. Ongoing maintenance and evaluation of your roofing system goes a long way towards the life of your roof. At Pickard Roofing, we think long term and invite sustainable building customers to give us a call for your free evaluation. For over 90 years Pickard Roofing Company has installed countless metal, tile, slate, TPO, EPDM, and all types of shingle roofing in the Triangle. Our services including residential, commercial, custom architectural metal fabrication and historical renovation.